1. Begin with your feet hip-width apart and your left foot a few inches behind the right. 2. Step on to a resistance band with your right foot and grab the band with your left hand. 3. Bend your knees, rotate your torso to the right and bring the left hand toward your right foot. 4. Stand up, rotate your torso slightly to the left and pull the band until it’s close to your left shoulder. 5. Repeat this movement for the duration of the set and then switch leg positions. Relax your head and neck, engage your core muscles, maintain your back straight and keep your feet and knees pointing in the same direction. Exhale as you pull the resistance band toward your shoulder and inhale as you release tension and bend the knees. The lawnmower band pull works your back muscles, helps define the waist and strengthens the glutes, biceps, and shoulders. This exercise is a modified version of the dumbbell bent over row that also engages your core, glutes and leg muscles. Do 2 or 3 sets of 10 to 12 repetitions on each side. 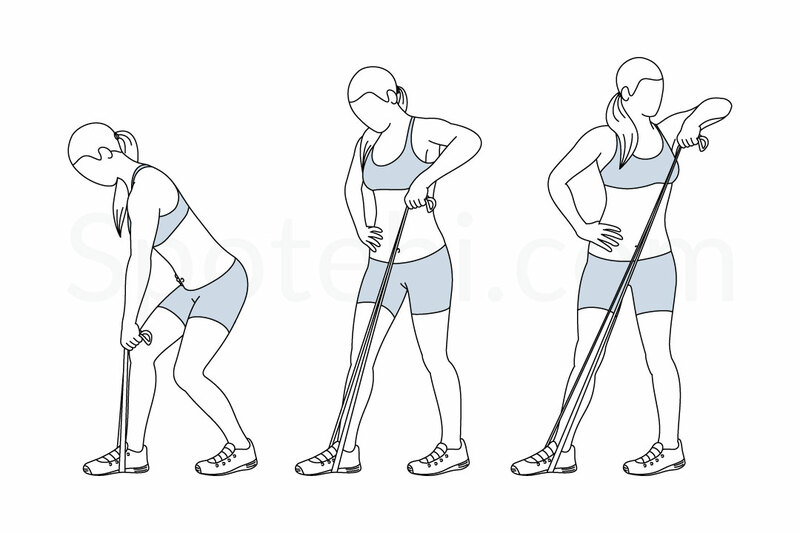 If you prefer, you can replace the resistance band with a dumbbell and do the lawnmower pull instead.